There's even a bracelet I wear every day with that first sentence stamped on it. I look at these words constantly, and I love their message but I've never really, truly internalized them and fit them into the context of my own life. That is, until several weeks ago, when my coach Jeron had a heart-to-heart with me via text about training for this meet. It's no secret that I struggle with even just showing up and making training a priority. I was supposed to start training in early January, but I had a difficult time getting things rolling (because of illness/motivation/time/whatever--you know me, it's always something, right? ), and I finally managed to build up some momentum, but I was worried about being behind on training because of what I'd already missed, and what sort of numbers I could still manage to hit at this meet. Anyway, he told me to stop worrying about numbers and to just trust the process. "If you can put in the work consistently, like, just show up and complete your workouts, you will be unstoppable." And I took that to heart. I stared at his words on my phone, and I stared at the words on the metal bracelet on my wrist, and I swore in that moment to make training consistently a priority. I made an effort to let go of whatever fear I might have been carrying in the back of my mind, and I decided that I would indeed give it everything I had in the time I had left, and see where that would take me. I wanted to see if I could rattle the stars. And I gave it my all, for sure. Barring a few accessory sets here and there (that I had to skip because I ripped my hand open), I did everything he planned for me, not giving up or taking shortcuts, even when all I wanted to do was go home and lie on the floor. I stopped letting myself make excuses, and I just showed up, and once I was there, I took as long as I had to to finish every single thing on the list. Also, worth noting, I decided not to try to drop weight to make it into the 198-lb class, even though I'm pretty close. I figured I could still make a decent showing in SHW (Super Heavyweight), and I just did not need one more thing to stress about. It was enough to train, to keep myself healthy, and to get myself to the platform in once piece. And yeah, I was nervous. I think I must have a nervous temperament in general, but even thinking about the meet was keeping me awake at night. It wasn't until we got to our peak week and I hit a 475 back squat that I really saw, like, actual real proof that everything I was doing was working. I trusted the process, and it was paying off big time. But of course, I had to be able to do it where it REALLY counted--on the official platform, in front of the official judges, to be recorded as official results. And here we are. I've been a MESS this past week. I was a mess at the meet. People always tell me I look so calm when I lift (and between lifts), but internally, I'm a swirling maelstrom of stress and emotions. My heart rate is like, sky high, and I'm struggling to breathe because I need to slow it down and also because sitting in a chair with a stiff leather belt cinched around my middle is not particularly comfortable, and my brain is going over all of the stupid ways I could tragically eff this up for myself after all of the hard work I've put into it. 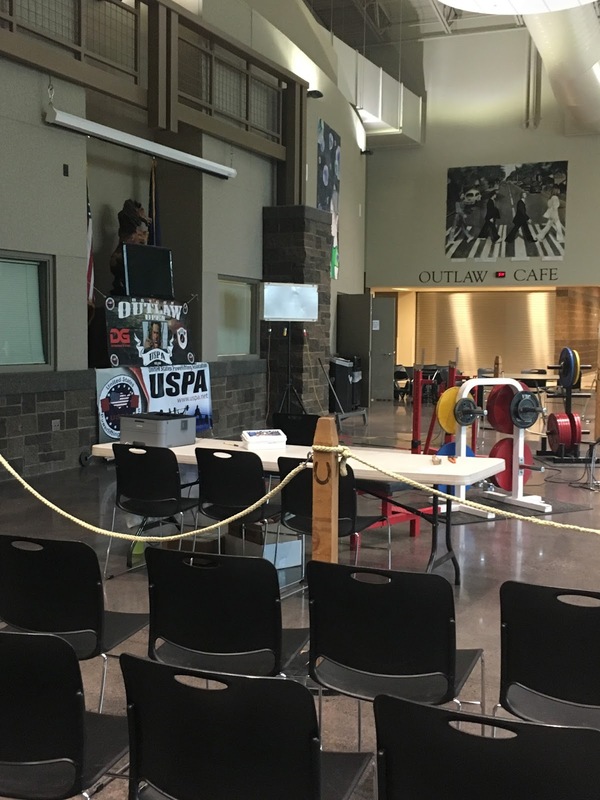 This was not my first EVER meet, but it's my first USPA meet, so in addition to personal goals (PRs, recording an official total, PERIOD), I've had it in my head that I'd like to try to break some records. 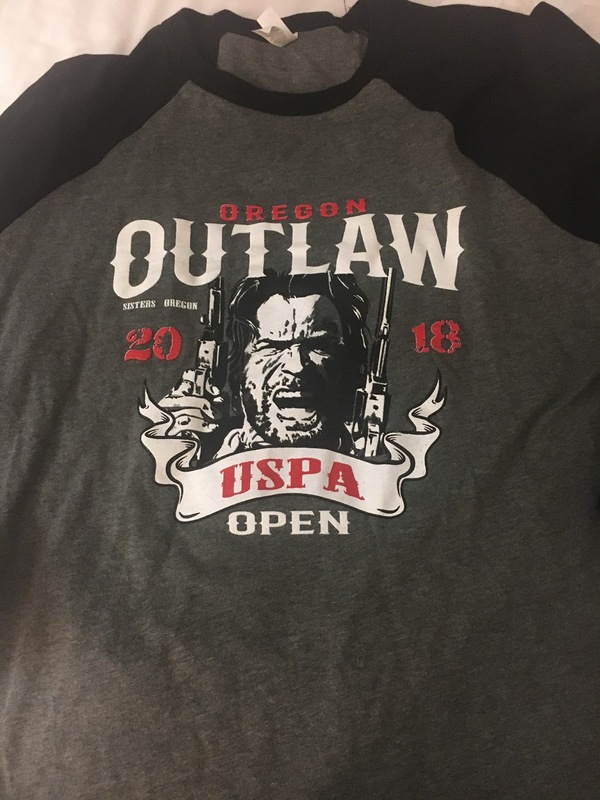 The drug-tested division of USPA is relatively new, so I have a chance to get my name in there. So that was an added Thing On My Mind. And I'd be lying if I said that earning a medal wasn't also a Thing On My Mind. I tried to remind myself that stuff like that is useless to worry about anyway, because it's beyond my control who else shows up to compete and how well they perform, but, you know, in the famous words of Helen Keller, "One cannot consent to creep when one feels an impulse to soar." Go big or go home, right? Worry worry worry. Stress stress stress. But aside from what was happening inside my head, things were good, actually. I felt prepared. And aside from lack of sleep, I felt healthy. If you recall, for my first-ever meet two years ago, I was struggling with so much knee pain going into it, and I was worried that would happen again (as if my knee had some sort of weight limit), but peak week put me at ease about that for sure, because that big squat was perfectly pain-free. My torn callus had healed, so I was good to go for deadlifts. Physically, I am the strongest I have ever been, even if mentally and emotionally I was... not so much. Also, I was there among teammates (from both gyms that I train with--more about that later), and I basically trust Jeron with my life at this point, so I knew I would be taken care of. I just needed to keep doing what I've been doing all along: LIFT THE BAR. Repeat 8 more times. Trust the process. Trust my gear. Trust my training. Trust myself. So, I opened squats at 182.5kg, which is about 401lbs. (I was chuckling on Friday at weigh-ins because for the second time, the person writing down my opener did a double-take when they realized that I did indeed mean 182 kilograms and not pounds.) 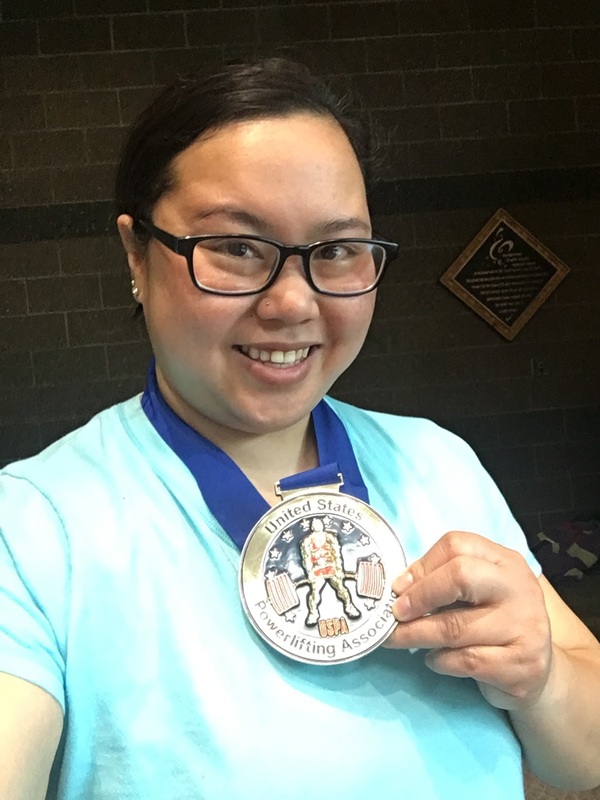 I went 3 for 3, finishing with a 473lb squat, earning myself a national record! I wasn't expecting this one, mainly because the records I looked up were higher? But I know nothing and probably looked them up in the wrong place, so... hey, I'll take it. And even if it ends up not being mine, I think I at least have the record for the state of Oregon, so... for someone who grew up a chubby, nerdy bookworm who couldn't do the sports thing, the fact that I am a state or national record-holder of ANYTHING athletic is a pretty huge deal. And moreover, my knee was totally, totally fine. Thank you, SBD knee sleeves! Next up was bench, and despite it being my worst lift, I was actually the least anxious about this one because I basically had zero expectations here for heroics. I told myself that I really only needed one good lift to get me through to deadlifts. 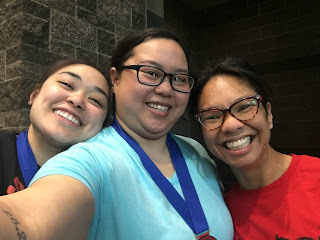 I opened at 60kg (135lbs), and finished at 165lbs, matching my previous PR. I definitely felt like I could've gone a little heavier for the final attempt, but such as it was, I'm not sorry. Bench press is still such a work in progress for me (in that, I'm still learning how to do it right, let alone trying to push my maxes! ), so 3 for 3 here was definitely a win. The jitters came back for deadlifts. The day was moving SO quickly (there were only four flights of lifters for day 1, with the heavier men's weight classes lifting Sunday), and I felt like I had just enough time in between events to catch my breath, change my socks or whatever, eat some snacks, and drink some water before it was time to warm up again. But I felt ready. This is my "bread and butter" lift, my most confident one, and besides, it was the end of the day, so I was ready to give everything I had left and leave it all on the platform. I opened at 182.5kg, just like my squat, telling myself as I approached the platform for the first attempt, "I can do this for reps! I can do this for reps!" (and then praying to God that I didn't forget where I was and actually start doing reps). It was fine, no problem. So was my second one. My third attempt at about 480lbs (see, I still don't remember precisely the number, but I know it was at least that much) got me a PR and a second National Record. And a perfect 9 for 9 on the day!!!! So, I didn't know before this weekend that if you are successful on your third attempt, and if you either break a record or are within spitting distance of one, you can do a FOURTH bonus attempt, and while I was sitting there during deadlifts, the thought crossed my mind that I might want to try that, depending on how my deadlifts went. Jeron apparently had the same idea, because after my record breaker, he immediately told me, "We're taking a fourth attempt!" So yeah, that was happening. He still wouldn't tell me what I was going to try for, but I had a pretty good idea what it would be, because honestly, I wanted it myself. 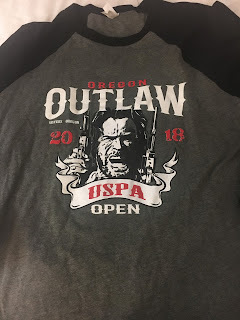 It's a number that has been looming at the back of my mind since Deadlifts for Doernbecher this past December, and knowing that it was the end of the day, the end of the competition, and I had nothing left to save my energy for, I figured I might as well GO BIG OR GO HOME. Or rather, go big and THEN go home, knowing that I gave my absolute all. However, fourth attempts mean that you don't get to sit through a full flight of lifters before you have to lift again, if you were the very last person in your flight like I was. I had MAYBE five minutes? 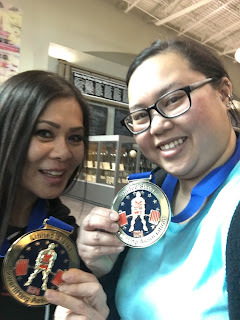 There were two other lifters taking fourth attempts, and then I would get a bonus minute to rest, and then the usual minute that all lifters get once their bar is loaded. That is NOT a lot of time. And yeah, it was the end of the day, and I had already completed the normal load of 9 big lifts for the day, and I was exhausted. "FIVE HUNDRED POUNDS," the announcer's voice boomed over the mic as my bar was loaded. I can do this, my internal voice whispered as my final minute started. Usually when I deadlift, I walk up to the bar, I set my feet, I set my hands... I get into position... I take one last, long exhale... And then my brain shuts off as I start to lift. However, this one time, I let myself take just an extra moment as I got into position, to just look up and take it all in. This was the END--I had spent all day rushing from one lift to the next, head stuck in my cloud of worries, and for this final, last lift, I just wanted to really appreciate where I was and what was happening and let myself be just outside the moment for a little bit before it was all over. Look at where you are, look at where you started. The crowd section had not looked particularly full all day, as people were constantly walking around, getting food, heading to or from the warm-up room, etc. But in that moment, from my perspective, it looked absolutely packed, as if everyone in the room had stopped for me. Like, everything stopped for me. I saw phones everywhere, pointed at me. There was lots of yelling. So much yelling that I bet the stars were definitely rattled. I wish I could show you what it looked like from my perspective as I walked out to the platform. It was a surreal moment that I will never forget. But it was just a moment. I could only give myself that one moment. And then I pulled. I fought with that bar for what felt like an eternity, but finally it slipped from my hand, and that was that. I didn't quite have enough left in me to lock it out this time, but I fully believe that with a little more work (and a little more rest! ), I WILL get it done. I'd be lying if I said "I'd be proud of myself no matter how I did!" because let's be honest, actually ACHIEVING your goals feels pretty damn good. But at the very heart of all of this is the fact that DUDE I ACTUALLY SHOWED UP THIS TIME, because none of this would've happened if I had bailed out on training for this meet. Firstly, thank you to Downings Gym, USPA, Sisters High School, and the amazing crew of officials and volunteers for hosting and running this mighty fine event. BIG BIG thank you to Jeron Kerridge and all of Team Savage. Jeron qualifies for saint status as far as I'm concerned, for his unending patience with me while I tried to get my s*** together this past year and a half. I could not have done this without you. (In fact, I don't think I WILL ever do this without you, so I can only go where you go!) 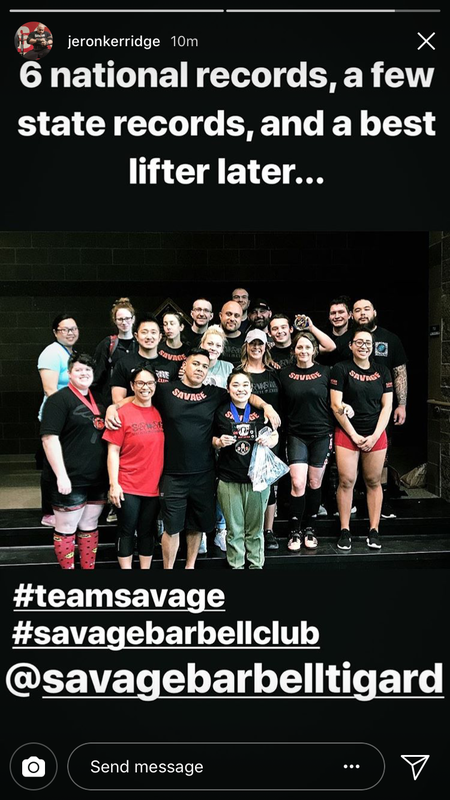 And Team Savage, you are one hell of a crew to run with, and I'm so grateful that you let me tag along with you :) Thank you for supporting me and taking care of me. 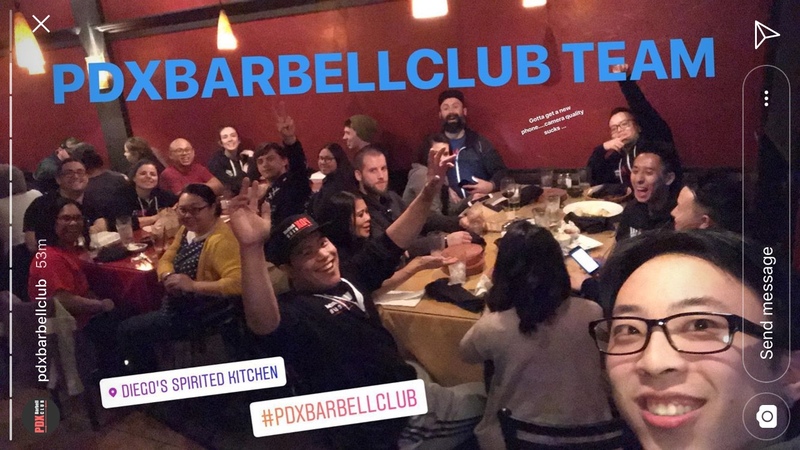 Also BIG BIG thank you to PDX Barbell Club. 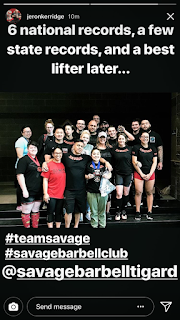 I haven't talked about this on my blog officially, but I have been splitting my time training at Savage (which is 35-40 minutes from my house) and training with PDX BBC (which is five minutes from my house), because the key to my success is training consistently, and the key to me training consistently was having options and flexibility in my schedule. Ergo, even though I'm officially designated Team Savage and Jeron handles all my numbers and plans, I would be remiss if I didn't express how absolutely fundamental PDX Barbell Club has also been in getting me to the big day. You guys welcomed me with open arms, and you always have a smile for me every time I'm there, and I couldn't have done this without you. Having the ability to train at PDX BBC made the difference between me getting to the platform at my best vs. me probably not even getting through training and dropping out of the meet. No joke. Thank you, Lea, for your nose boops, your gummy bears, and your shirt to keep the baby powder off my hands :) You are a badass and an inspiration, and I'm so lucky to have you as a teammate and friend. What comes next? I don't honestly know. I figured I would get myself through this meet first and see where it goes from there :) While I don't know what my next competition will be, I do know that, as far as specific goals go, I definitely need another shot at that 500 pull, and I also want to get my bench up. In the more-distant future, I'd love to nail a 1200 total (500/200/500). We'll see. I've got work to do. In the meantime: rest, recover, and then KEEP GOING. Pasting here the official meet results. I did better than I thought! Before you comment, please note: respect and patience go a long way. I'm a Muscle & Mirth athlete!